Brandon Devlin CARMEL – Coming off a season that was not all they hoped it would be, the Carmel High boys soccer team has reason for optimism. The Rams return eight starters from last season’s team, and believe they have the supporting ca… Please login below or purchase a subscription to the Putnam County Courier to access this content. Jenna Ruocco MAHOPAC – With the bulk of the starting lineup back for another season, the Mahopac High girls soccer team is looking for bigger and better things in 2009. The Indians will certainly be hardpressed to replace the explosiveness of… Please login below or purchase a subscription to the Putnam County Courier to access this content. CARMEL—The Carmel High field hockey team had a strong fall season last year, and coach Colette Brenneman is hoping a considerable core of returning players translates into another winning campaign. Here’s a look at this year’s Ra… Please login below or purchase a subscription to the Putnam County Courier to access this content. Right, from top: Adriel Barnes, Mike Benvenuto, Ryan Kuck, Jeremy Love. 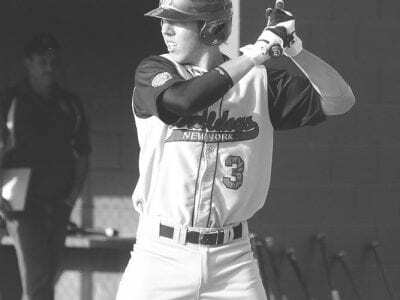 Photos by Skip Pearlman BREWSTER—The Tri-County Bulldogs 16U baseball team recently concluded its first summer season, and ‘Dogs manager Asa Barnes said the team had … Please login below or purchase a subscription to the Putnam County Courier to access this content. 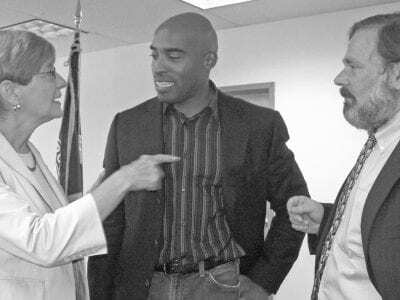 Right: Tiki Barber chats with Howard Yeager and Susan Constantino at a closed door meeting last week that laid the groundwork for a special recreational facility for the disabled. Former New York Giants running back Tiki Barber returned to Putnam la… Please login below or purchase a subscription to the Putnam County Courier to access this content. The Eleventh Annual Dr. Gil Rojas Memorial Golf Tournament to benefit the Putnam Hospital Center Foundation will be held on Monday, October 5, at the Mahopac Golf Club in Mahopac. 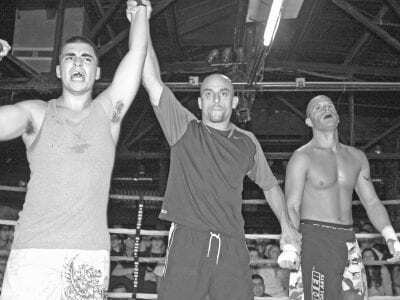 The tournament is being held in memory of Dr. Gilberto Rojas, a me… Please login below or purchase a subscription to the Putnam County Courier to access this content. Juliano Zanetti fighting for USA Karate located at Patterson Recreation Center won his kickboxing bout this past Friday night at Tuxedo Junction in Danbury, CT. Juliano will be fighting for the AKBF 155lb Kickboxing championship on October 10th at th… Please login below or purchase a subscription to the Putnam County Courier to access this content. Dear Editor: I wish to respond to former Sheriff’s Inspector General Pat Perry’s concerns about the photograph taken of Mr. Perry sleeping at his desk. I showed that photograph at a candidate’s debate. I want to make the record… Please login below or purchase a subscription to the Putnam County Courier to access this content.